Eastman Opera Theatre (EOT) presents The Tibetan Book of the Dead, with music by Ricky Ian Gordon, and libretto by Jean-Claude Van Itallie, November 1, 2, 3, and 4 at Kilbourn Hall. This piece is one of Ricky Ian Gordon’s most personal works, coming to fruition after the loss of his partner, Jeffrey, to the AIDS crisis of the 1980s. 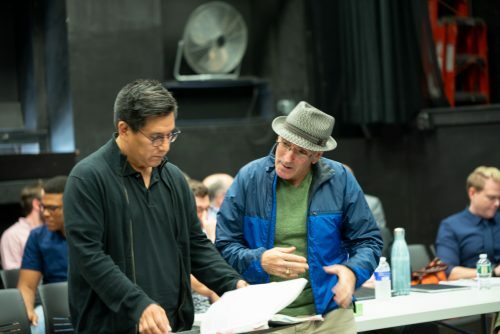 This moving piece, commissioned by Houston Grand Opera and The American Music Theatre Festival in 1995, has only been performed twice, with the last performance occurring over twenty-two years ago. On September 24, 2018, EOT’s cast of The Tibetan Book of the Dead had the opportunity to work with Mr. Gordon on this challenging piece during his week-long residency at the Eastman School of Music; the first time the composer himself had heard this piece in twenty-two years. Composer Ricky Ian Gordon, discussing the score with Professor Timothy Long. As a member of the cast, I can safely say that we were all quite nervous to perform this work for Mr. Gordon in person. 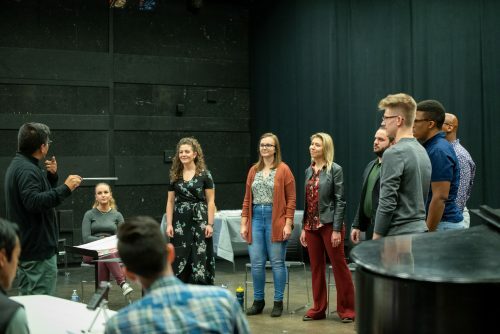 When you come to see the production, you’ll soon discover that it is so much more than just a uniquely beautiful piece of music. It truly is a gift of Mr. Gordon’s personal experiences, crafted into this detailed work that can serve as a teaching to anyone, on how to live one’s life without fear and uncertainty. Needless to say, we all felt the pressure to do this music justice. However, upon meeting Mr. Gordon, I realized how incredibly kind, open, and genuine he was. Mr. Gordon was so honest with the entire cast about this difficult time in his life that led to the creation of The Tibetan Book of The Dead, and I think this really helped us to forget about the difficult rhythms and challenging melodies we were about to perform, and simply sing the truth of the text. I certainly was not the only cast member who felt this way. 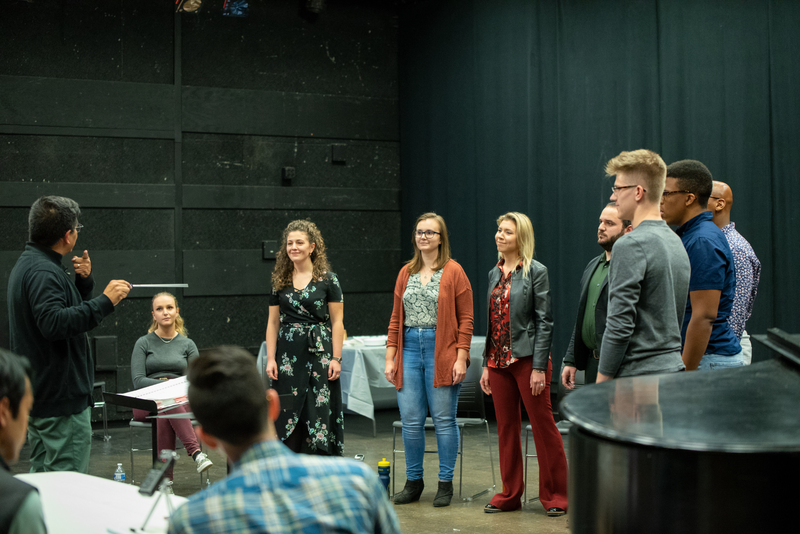 In the midst of all our musical rehearsals, and table-talk discussions about our characters, I had a few minutes to sit down with Mr. Gordon personally, and ask him several questions I thought other Eastman voice students might also be wondering about. Does your creative process of working with a cast of student singers differ from when you’re working with a cast of professionals? Yes, for example you have to enter the room with different expectations. You have to know that students are often at the beginning of their process, and they’re still figuring things out technically. Don’t forget that when I wrote Tibetan Book of the Dead for the Houston Grand Opera Studio, every single one of those people practically became a star. They were finished artists in terms of where they were vocally. So I know that I have to allow for people that are along the road in a different way technically. That said, I want to do everything in my power to make you be as great as you can be. I also know that sometimes you can get something really fresh out of people that are at the beginning of the process. I can inspire something in you simply because we’re both aware of the privilege we’re having. I know you know that its a privilege that I’m here, and for me its a privilege to be with young people and to try to elicit and imbue you with my intentions. The cast of The Tibetan Book of the Dead performing for Ricky Ian Gordon, composer. Left to Right: Professor Timothy Long, Sally Curran, Sarah Forestieri, Kathie Kane, Maria Vasilevskaya, Nathaniel Catasca, Marcus Jefferson, Travon Walker, Nathaniel Malkow. Photo by Michelle Martorell. 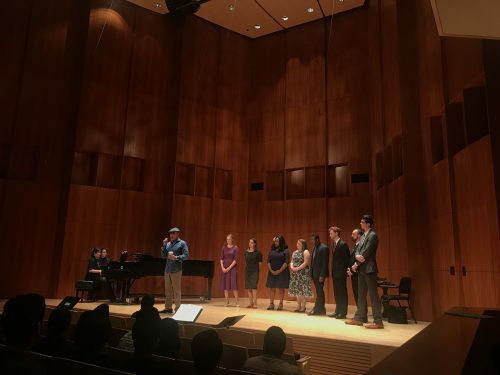 What type of advice would you give to a singer who is just beginning their time here at Eastman, versus a singer who is getting ready to graduate and enter the professional world? Someone like Audra MacDonald, who obviously became a big star very quickly – when I first met Audra and worked with her, I had never seen anyone so prepared. We were going to do a concert in New York at Symphony Space and she was going to sing three of my songs. But she was in Toronto doing Ragtime, and couldn’t come to New York until the day of the concert. So at eleven in the morning that day, she came over to my house to sing through the songs with me. They were flawless. She had clearly worked so hard on those songs, and she tore the house down that night. I like to tell singers that everything you have to offer is what you have to offer. But you need to come in prepared and professional, and ready-to-go, and memorized when you’re supposed to be memorized, and researched! Another thing: a couple years ago I premiered my opera 27 and my friend Elizabeth Futral played Alice; she’s on the recording. Elizabeth had done so much research about Alice B. Toklas, she could tell you as much about Gertrude [Stein] and Alice as I could. That kind of stuff, to take your work seriously. To take yourself as an artist seriously. To never let anyone accuse you of being lazy, because everything you bring to the table is going to make you richer in the piece and is going to make everyone want to work with you again. Yes, its about the voice and its about everything you offer, but if you’re also one of those people that is reliable, and does their work, and is interesting to work with, and comes to the table with a lot of knowledge, research, and ideas – all of that goes a long way. I would tell that to anyone; beginner or later down the line. There is nothing as frustrating as someone who hasn’t done their work, and it happens all the time. It happens more with professionals than with people like you, where they come in and they don’t know the piece. And you have to spend half the time just teaching them the notes when what you wanted to do was spend the time going deeper into the character and the content, and that’s frustrating and upsetting. When you sit down to compose, do you find that after you’ve fully embodied the text that the music is already there and it’s a matter of writing it down, or is it process of building it musically layer by layer? It really depends. Some songs, like “The Red Dress,” exploded out. I wrote it in an hour. And then some songs you have to struggle with more. And that might have been for example because, “The Red Dress,” is a strophic text. But when I set, “What the Living Do,” that took a longer time to find the patterns in the text. There’s no hard and fast rule. All there is, is a beginning, and usually if you begin it’s as if you’ve laid the first stone. Then the process for that particular piece starts to happen. Whether it be fast, whether it be stone upon stone, whether it be laborious, whether it be sad, whether it be happy, whether it be flowing, whether it be stilted. Whatever it is, you lay the first stone and the piece starts telling you the story of how it’s going to be written. And every piece is different. The piece I just wrote recently, Ellen West, it was definitely a hard piece to write. Hard because of the content, and hard because I love this poem so much and there isn’t a single pattern in the poem. So you’re really setting prose to music. Do you feel this way about The Tibetan Book of the Dead? You had mentioned earlier that this is something different from anything else you had written. It is a strange mysterious thing. I had to write The Tibetan Book of the Dead so quickly, and under such dire circumstances that I don’t even know how I came up with these things. Like where did I get that opening? Stravinsky said a very famous line about writing Le Sacre du Printemps: “I am the vessel through which passed Le Sacre.’ Sort of like that. I do feel that everything I write in the end feels like it was given to me. The cast of The Tibetan Book of the Dead performing at the Ricky Ian Gordon Master Class. Left to right: Mei-en Chou (piano), Ricky Ian Gordon, Carley Campbell, Lauren Nash Silberstein, Veena Akama-Makia, Megan Graves, Jonathan Rhodes, James Henry Benson, Nicholas Saxton, Michael Galvin. Photo by Sarah Forestieri. This piece was written during the AIDS epidemic of the ’80s and ’90s. As a cast, our goal has been to try and decipher what the current epidemics in our society are, bringing them to light in this production. What do you feel is one of the most troubling epidemics in today’s society? Today, I think we’re in an epidemic of lying. What I want to talk with you guys about is how to find the truth. The truth in you and the truth in the piece, because there is nothing worth projecting and putting out into this world except for the truth when there is such lying and hypocrisy around us. In terms of the world of opera, what do you think we as young artists need to do in order to keep this art form alive? I think you as the young generation of singers need to know that the age of opera singers who don’t live in their bodies and can’t act is over. Because if you look around, what’s really starting to sell and generate excitement is new work. Nobody wants to write for people that can’t convey on the stage what they have written on the page. So you are called upon for more. You have to have the voice, and you have to have the technique, but you also have to live in your body. You have to be able to move, you have to be able to convey character, and you have to be able to act. So that’s what I would say: you are the new generation of opera singers that have to bring it all to the table. Tickets for Eastman Opera Theatre’s production of The Tibetan Book of the Dead are available online at EastmanTheatre.org, in person at the Eastman Theatre Box Office (433 East Main St.), or by calling (585) 274-3000. Ricky Ian Gordon will be back in Rochester for pre-performance chats on November 1 and 2.